A dotted curve - are shown (27-days) values of cosmic rays intensity with 1999-2018, scale on the right. Continuous curve - corresponding values of fluctuations parameter - a scale at the left. The level of significance (90%) is shown. Precursors: the BEGINNING of cycle 24 is shown by dotted arrow, phase GROWTH of a current cycle - a continuous arrow of black color, a phase of a MAXIMUM 24 cycles - an arrow of red color, the beginning the phase of INVERSION - a dotted arrow of dark blue color, a geoeffective phase of the beginning branch of DECREASE - a continuous arrow of dark blue color. 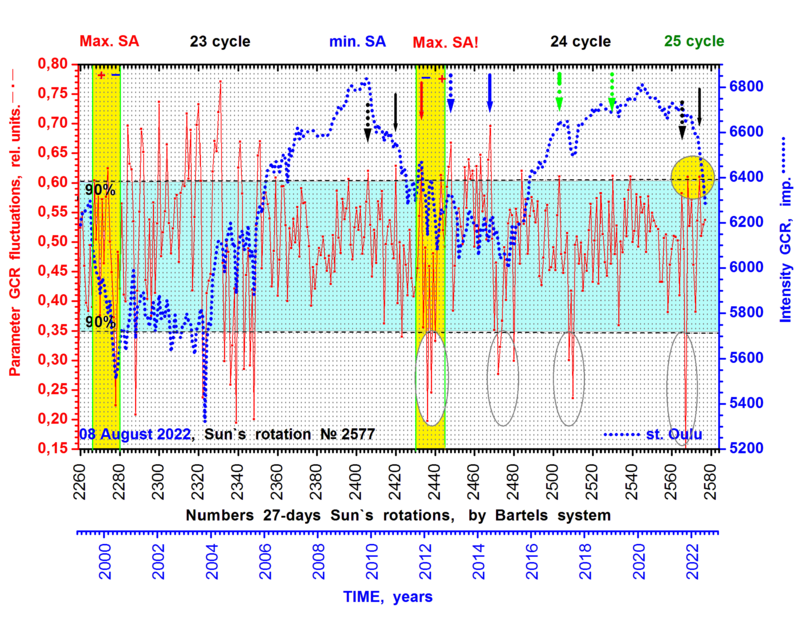 LOW values of fluctuations parameter in 2011-2012, 2014- 2015 and 2017 (enclosed in an oval) - indicated on DIAGNOSTICS of active phases of a solar cycle.